Have your clients been asking for simple benefits that don’t cost them a fortune? Well, you just found the solution. 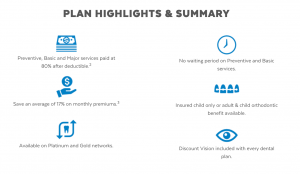 Dental Select’s High Deductible Plan1 offers low premium and transparency with our easiest plan design yet. Simple, straightforward and affordable. The way dental should be. After members satisfy an annual deductible, all covered services for Preventive, Basic & Major will be paid at 80%.2Pretty simple, right? The deductible applies to Preventive, Basic, and Major services. No waiting periods apply to Preventive or Basic services. A 12-month waiting period applies to Major services, and orthodontia if elected. Simply send the required information to one of our underwriting specialists at quotes@dentalselect.com. After members satisfy an annual deductible, all covered services for Preventive, Basic, & Major will be paid at 80%2. Pretty simple, right? An unlimited maximum that applies to Preventive, Basic, and Major services on a per member, per calendar year basis. That’s right, no waiting periods on the services you’ll use most. After Deductible – Includes routine exams, cleanings (2 per year), topical fluoride, x-rays, sealants & space maintainers, composite fillings, extractions, and oral surgery. After Deductible – Includes crowns, bridges, dentures, endodontics, periodontics, and implants (alternate benefit applies). Per member/family, per calendar year. Applies to Preventive, Basic, & Major services. Per member, per calendar year. Can now be quoted with 2+ enrolled. Adult + Child Ortho plans available. *Plan features marked with an asterisk can be customized upon request. Plans are not available in all states. Minimum of 2 enrolled and 75% of eligible employees. Groups of 2-20: Minimum of 2 enrolled and 25% of all eligible employees. Groups of 21+: Minimum of 5 enrolled. Voluntary groups which have not previously offered a dental program within the last 12 months will include waiting periods unless otherwise requested and approved. How do out-of-network benefits pay? The plan pays based on percent of R&C. No waiting periods apply to Preventive or Basic services. A 12-month waiting period applies to Major services, and orthodontia if elected. Voluntary groups which have not previously offered a dental program within the last 12 months will include waiting periods unless otherwise requested and approved. Yes, an implant benefit option is available. What networks are you contracted with? National leased networks include: PPO USA, Careington, Dentemax, and Maximumcare PPO. Dental Select also owns networks with availability in Texas and Utah. Dental Select’s High Deductible Plan is not a High Deductible Plan (HDHP) for purposes of establishing a health Savings account (HAS) or eligibility for and HAS. In-network plan payment based on fee schedule, out-of-network plan payment based on R&C. Waiting periods may apply. Orthodontia services are covered at 50%, if orthodontia is elected. See plan summary for details. The monthly premium for Dental Select’s High Deductible dental plan is 17% less, on average, across all tiers, than a standard $50/$150 deductible Dental Select dental plan with comparable benefits at 100/80/50 coinsurance levels. Unlimited Maximum benefits are not available for orthodontia services, which have a $1,000 Lifetime Maximum.